Meeting Robert Englund was anything but a NIGHTMARE! ROCK N SHOCK 2011 brought together various cast members from the 80’s slasher franchise A NIGHTMARE ON ELM STREET. The most noteworthy of these was Robert Englund who has appeared many times in my native Chicago at the FLASHBACK WEEKEND conventions. Despite this fact, I had never formally met him. I’m not exactly sure why that was, but I suppose it might have been that I was never a huge fan of those films. I know this is probably coming across as horror blasphemy right now but, “back in the day,” I preferred my horror deadly serious and didn’t care for the clever puns and humorous turn the series would end up taking. When news that a new NIGHTMARE film was being released in 2010 I was one of the few who wasn’t offended. I liked the idea of a more serious Freddy and thought it might endear me more to Elm Street in general. It did, though not for the reasons I had envisioned. Instead of hailing the new series, I walked away a bigger Robert Englund fan than ever before. 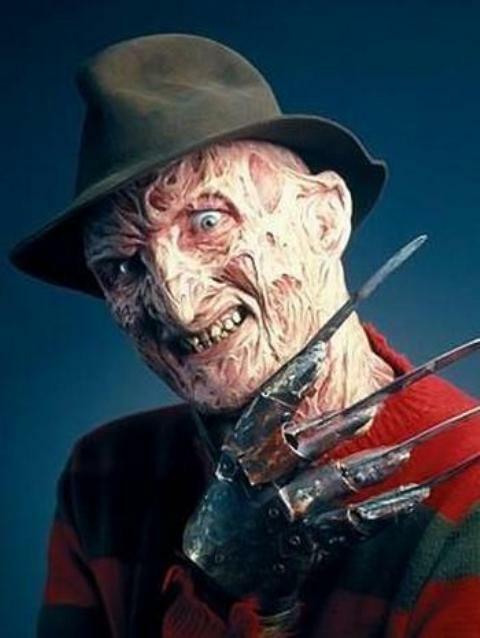 There can simply be only one Freddy and Englund, in the mind of most horror fans, is absolutely the one. Englund would later contend that the problem wasn’t so much their choice of who would play Freddy, but the decision of the film-makers to start the killings right off the bat as opposed to allowing the audience a chance to become emotionally vested in its victims. I agree that this is probably true but the absence of Englund was equally a problem. The new “realistically” burnt Krueger was unable to emote like Englund’s and, let’s face it, have as much fun with the role as he had. After suffering through the remake, I decided to immerse myself in the original series – enjoying them ALL (well okay, the first three) as if for the first time. As mentioned, the turn out for ROCK N SHOCK was impressive. Even on a Friday night, David and I would spend over two hours waiting in line to see Englund. During that time we did our fair share of “people watching” while my bum knee ached a reminder that I was getting a bit old for this. 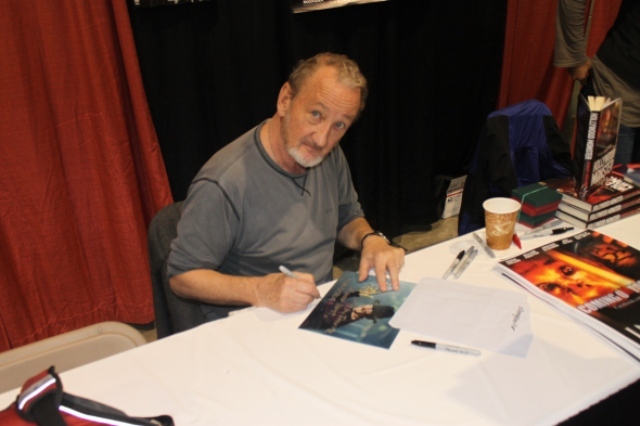 We chatted with a few fans that were standing before us and were shocked when one got all the way up to Englund’s table before leaving disgusted that he was charging $30 an autograph (which included photo). Personally, I didn’t think that was too steep all things considered and felt infinitely happier standing in that line as opposed to the other big draw, Ace Frehley, for reasons illustrated when I met him last July (and told HERE). I had mentioned before that you should try and come up with something specific to say to a celebrity when you meet them – not stand there with your mouth agape nor talk their head’s off (while the rest of the line gets pissed). Robert Englund was one celeb where this wouldn’t be an issue. Last July at FLASH BACK WEEKEND, he met up with national horror host, Svengoolie, and surprised Sven by not only telling him he was a fan, but by reciting the exact time/channel number he appears on his local MeTV affiliate. David and I had made up our minds that we were going to keep our TERROR FROM BEYOND THE DAVES shirts in our suitcases that first night and don the new Svengoolie shirts instead. Of all the celebrities The Daves have met, I must say that Robert Englund was one of the most spry. He moved about, was quite chatty, and would plug his book and special NIGHTMARE ON ELM STREET “behind the scenes DVD” while signing away. 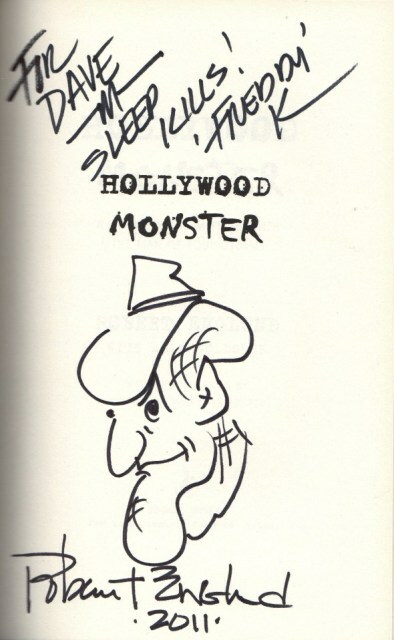 I remembered Svengoolie recommending his book in one of his blogs even before their meeting at FLASHBACK. I bought myself a copy and, as he signed it, mentioned this to him while pointing out that we were wearing his shirt. At the mention of Svengoolie, Englund became even more animated. “Oh, yes, I love his show!” he said. “I like how he gives back-story on the films which, even though he adds a lot of great humor, shows how much he respects the material.” After listening to Englund the next day at the NIGHTMARE ON ELM STREET Q&A session (to be covered later) I understood why this would be important to him. The theatrically trained actor has a devout love of both stage and film and is a lot deeper than his more famous roles would have you imagine. He signed an autograph for Sven (which you can see me giving him at the zoo HERE) and then jumped up for a photo! As the photographer prepared to hand us back our camera, England yelled, “Hold on! One more!” and then insisted that a second shot be taken of himself pointing to the image of Sven on our shirts! No, I did not start giggling like the Pillsbury Dough Boy! Robert Englund was a great celebrity encounter and, if you’re a Svengoolie fan, I’ve just given you the perfect ice-breaker when you meet him. He was well worth the wait time and his participation in the Q&A panel the next day secured his status in my mind as not only the one TRUE Freddy, but one of the finest actors Hollywood has to offer. I look forward to reading his book which, I have no doubt, will keep me from falling asleep! This entry was posted in Celebrity Encounters!, Convention & Expos, Monsters, Slasher Movies and tagged ROBERT ENGLUND, ROCK N SHOCK, Svengoolie. Bookmark the permalink. ← Howling for Asia Eriksen’s Werepups!